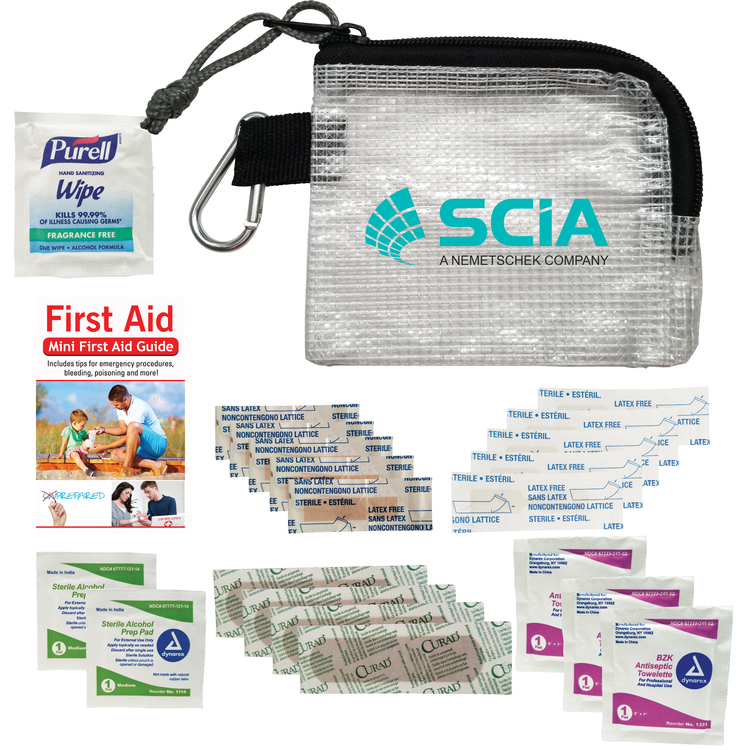 BUDGET PRICED 1ST AID KITS FOR OUTDOOR & TRAVEL PROMOTIONS! 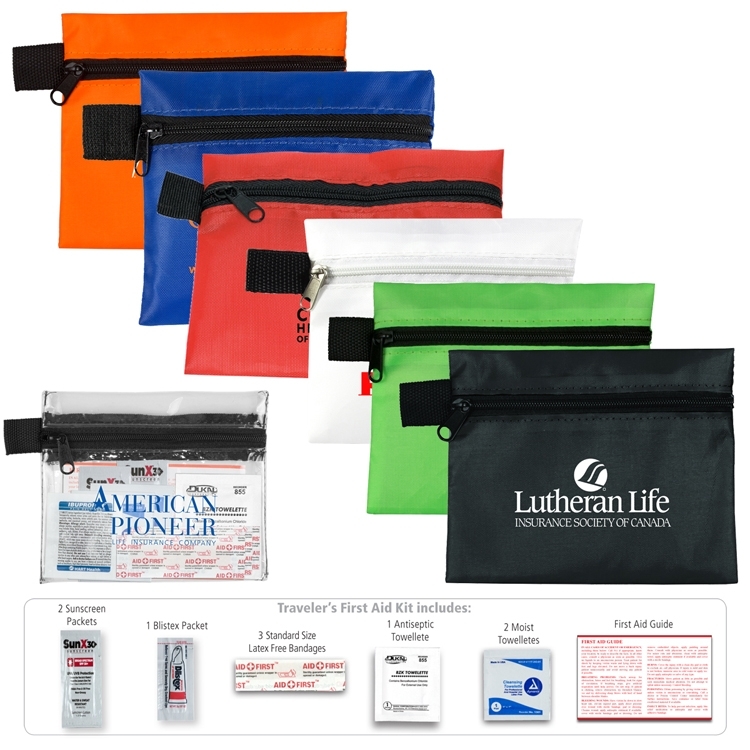 Over 200 Styles & Colors of 1st Aid Kits Available! 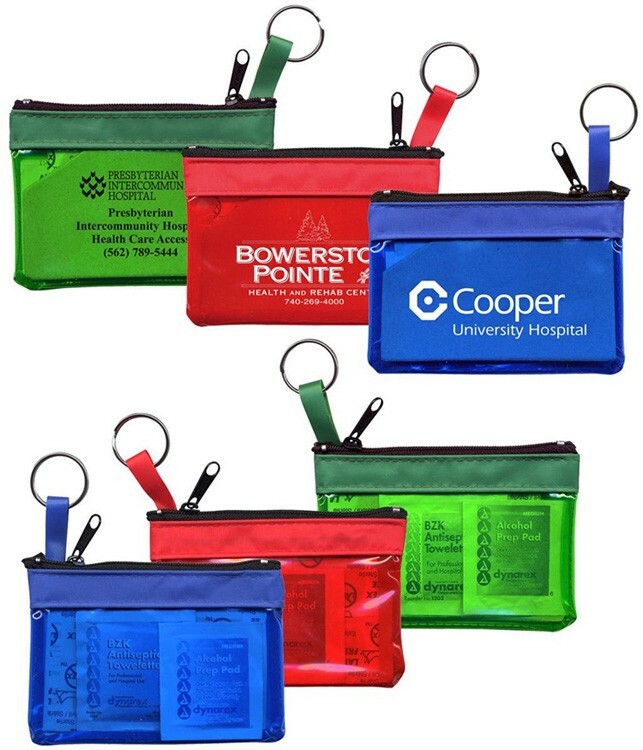 The Rainbow Budget First Aid Kit features Translucent Vinyl in 8 colors with a sturdy key ring that attaches inside. Includes 3 bandages, 1 Sterile Alcohol Pad and 1 BZK Antiseptic Towelette. 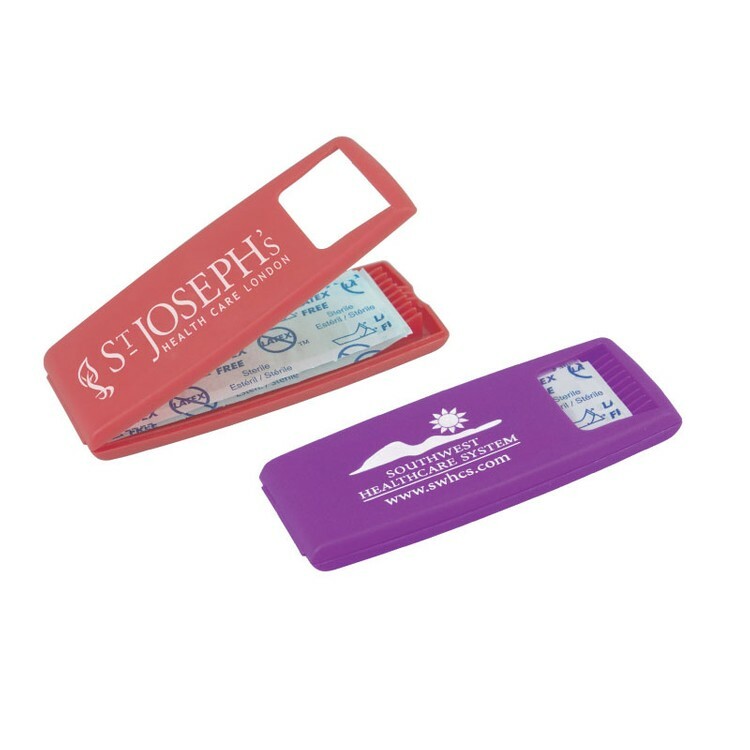 Prices include a 1 color foil stamped imprint on the front. Silk-screening for PMS color matches, multi-color, or full color imprinting may be available, see “Options” above. 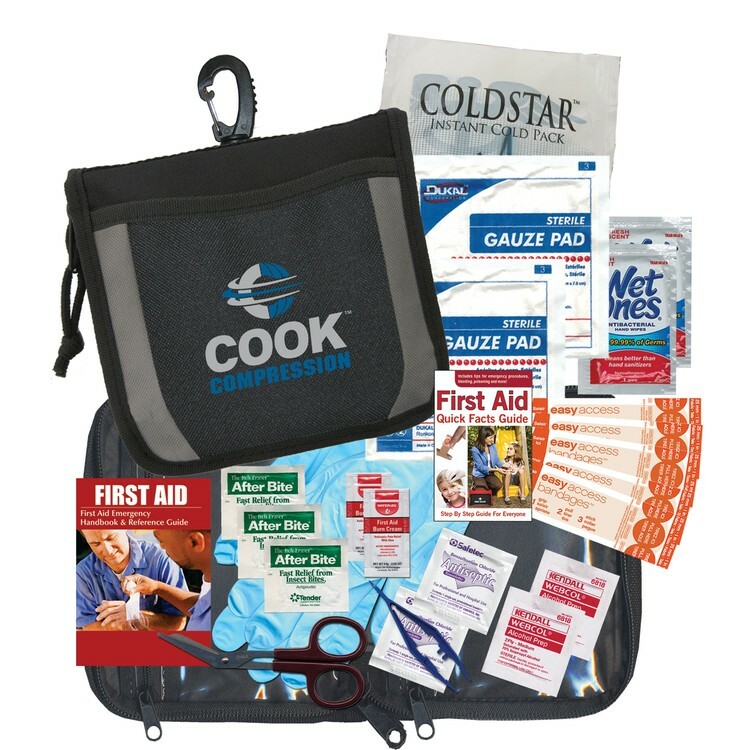 Maintain the health of your brand when you offer this great first aid kit to your customers! 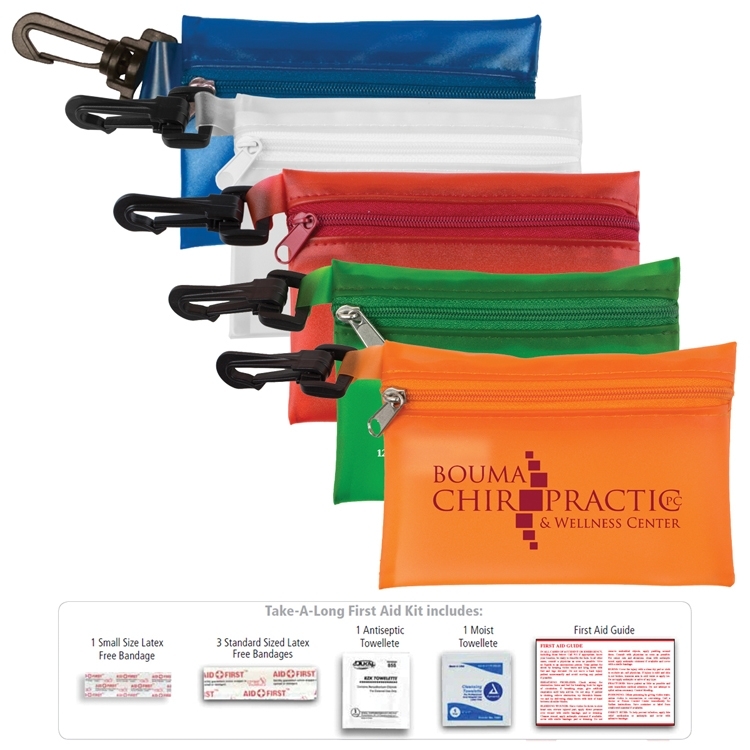 Available in four colors, this 6" x 6.5" nylon pouch is filled with everything you'll need in case of an emergency. With customization options offered, you can promote a new safety campaign, first aid certification program, wellness campaign and more! 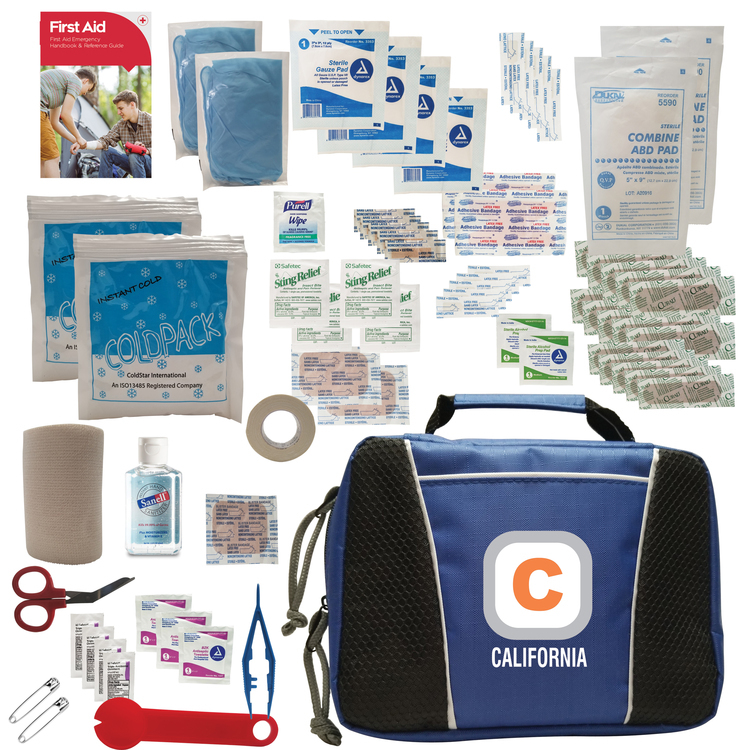 This kit includes 1 Pair of Nitrile Gloves, 1 Scissors, 1 48pg First Aid Guide, 1 Ice Pack, 2 Gauze Pads, 2 Wet Ones Wipes, 1 Tweezers, 2 First Aid Burn Cream Packets, 5 Bandages, 3 After Bite Sting Swabs, 1 First Aid Quick Facts Card, 2 Alcohol Wipes, and 2 Antiseptic Wipes. 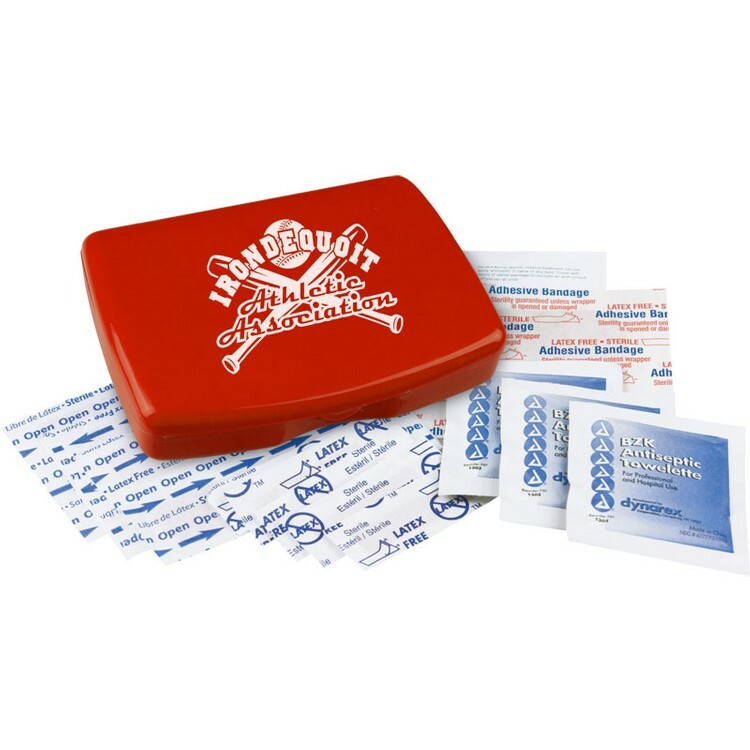 This LifePac first aid kit is the perfect safety measure for small injuries at home! 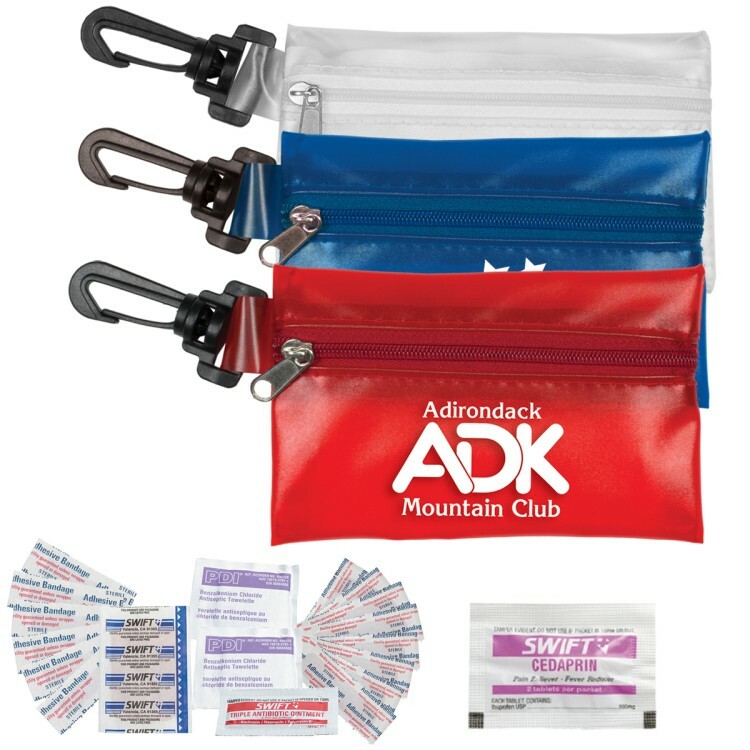 Inside our nylon pouch comes a guidebook, 2 ice packs, 1 pair scissors, 1 pair of nitrile medical gloves, 1- 3 " elastic bandage, 4 triple antibiotic ointments , 2 ab pads (5" x 9"), 4 sting swabs, 10 junior bandages (3/8" x 1.5"), 2 specialty knuckle bandages, 2 flex-fit large patch bandages (2" x 3"), 12 flex-fit bandages (3/4" x 3"),10 butterfly bandages, 1 pair of tweezers and more. Ripstop nylon first aid kit packed with a variety of high quality first aid products. Handy front pocket, durable carabiner and a handle are some of the features of this bag… Not to mention the carefully designed first aid fill. 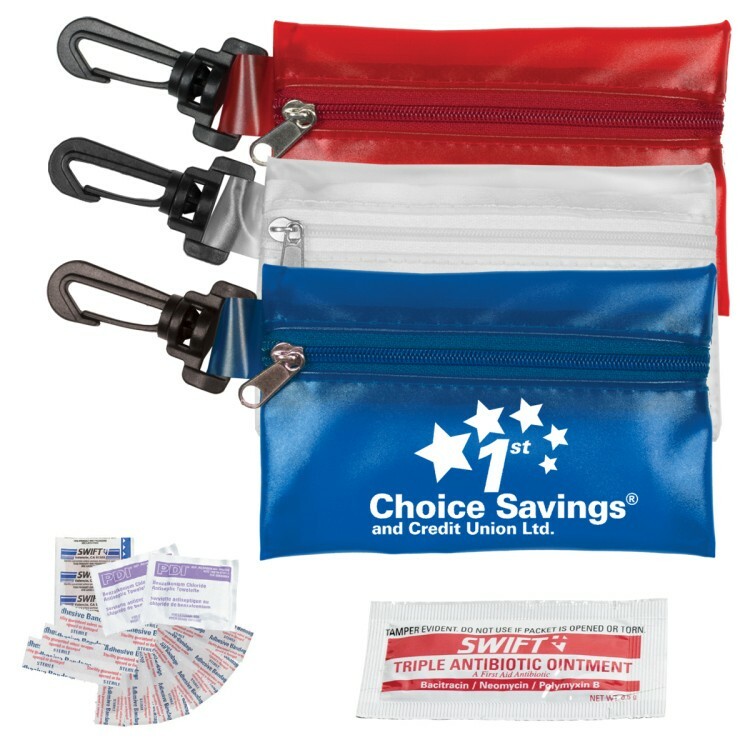 It includes: 1 First Aid Comprehensive Emergency Manual, 1 Ice Pack - Instant 5" x 6", 1 Purell Anti-Bacterial Wipes, 2 Triple Antibiotic Ointment 0.5g, 3 Sting Swabs , 1 Scissors - 5" Stainless Steel, 10 Junior Bandages 3/8" x 1.5" and more. Even minor emergencies can turn into stressful situations, so be prepared with the help of this handy first aid kit! 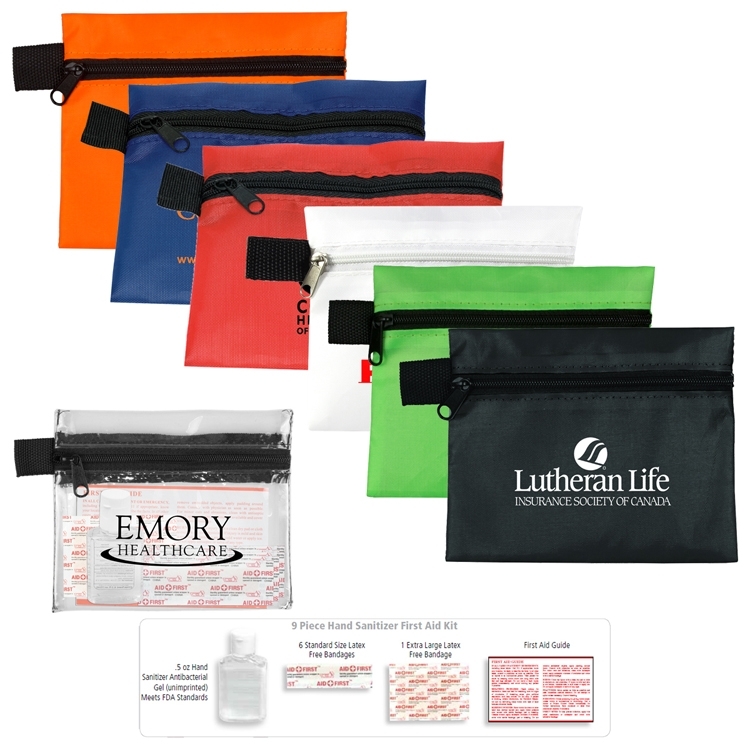 Customize the pouch with a one-color imprint of a brand name or logo. 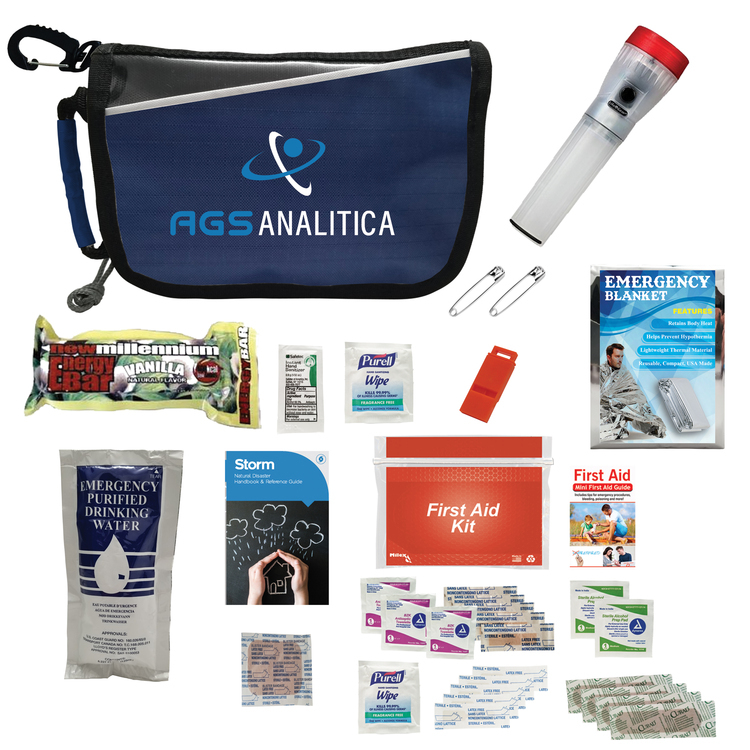 Perfect for tradeshow giveaways, health and wellness seminars and more, your customers are going to love getting a hold of this kit! 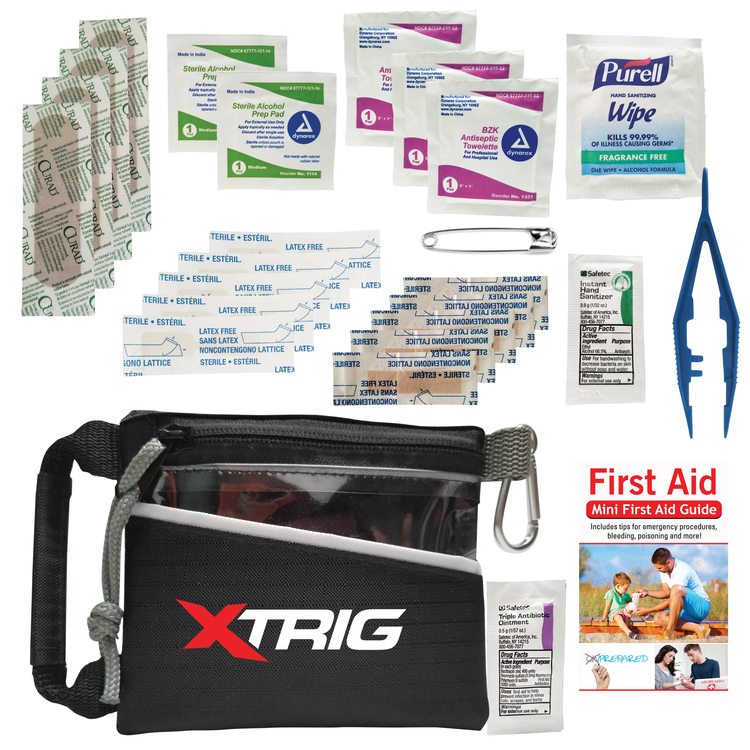 This kit includes 2 Wet Ones Wipes, 1 Tweezers, 2 First Aid Burn Cream Packets, 5 Bandages, 3 After Bite Sting Swabs, 2 Alcohol Wipes, 2 Antiseptic Wipes, and 1 First Aid Quick Facts Card. Here is a great product that will put your clients first! Select this economy first aid kit. 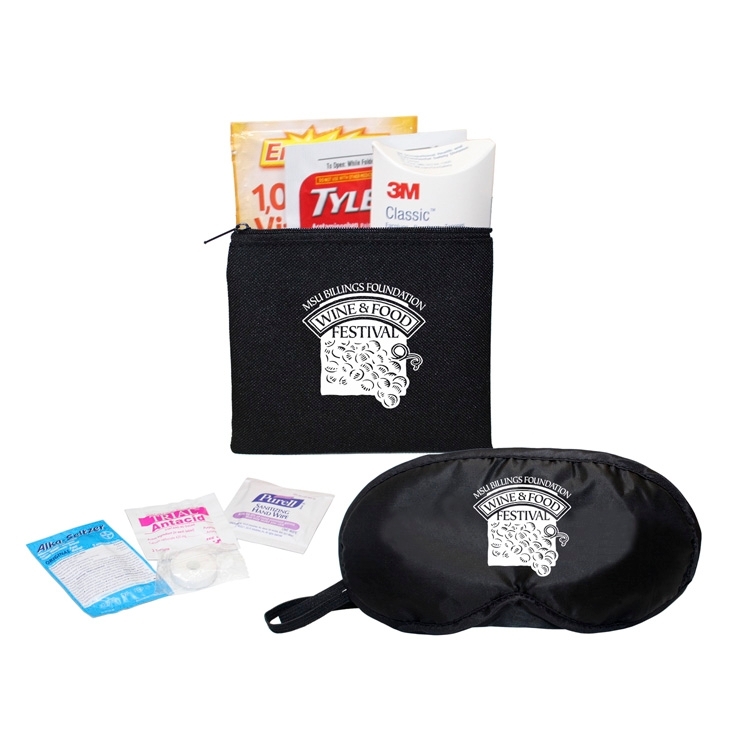 This wallet style first aid kit contains 4 standard size bandages, a moist towelette, an antiseptic towelette and a first aid guide. Add your logo for an awesome opportunity to promote your business. 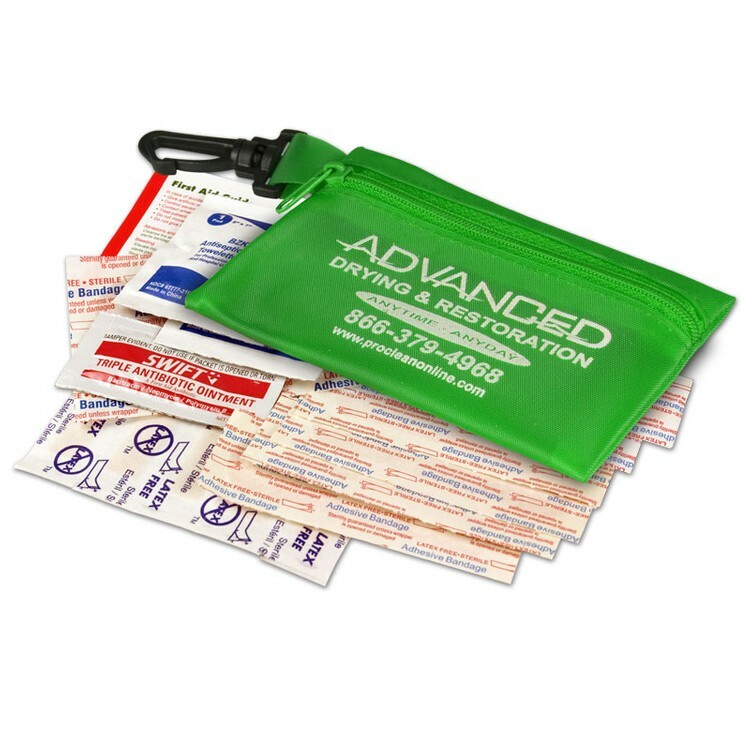 Lightweight and inexpensive, these first aid pocket packs are great for mass mailings and handing out at tradeshows. Make sure to order yours today! 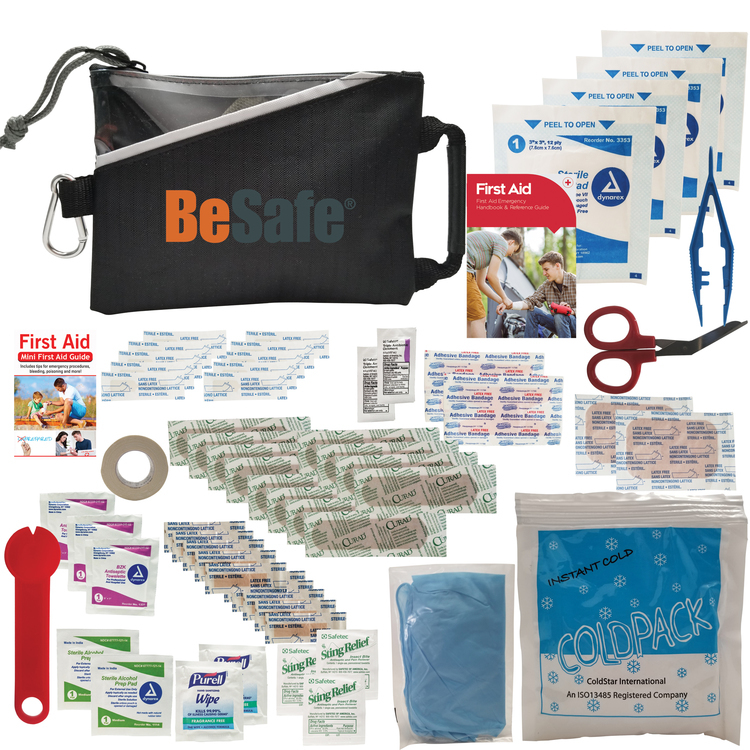 Expand your brand reach with this Go Safe first aid kit! Inside of a slim nylon pouch comes a guidebook, 1 triple antibiotic ointment 0.5g, 1 tweezers, 4 flex-fit bandages (3/4" x 3"), 5 junior bandages (3/8" x 1.5"), 5 butterfly bandages, 1 Purell anti-bacterial wipe, 2 alcohol prep pads, 3 BZK antiseptic wipes, 1 safety pin, and 1 hand sanitizer packet. This also features a carabiner, comes in several fantastic colors, and is perfect to take just about anywhere. 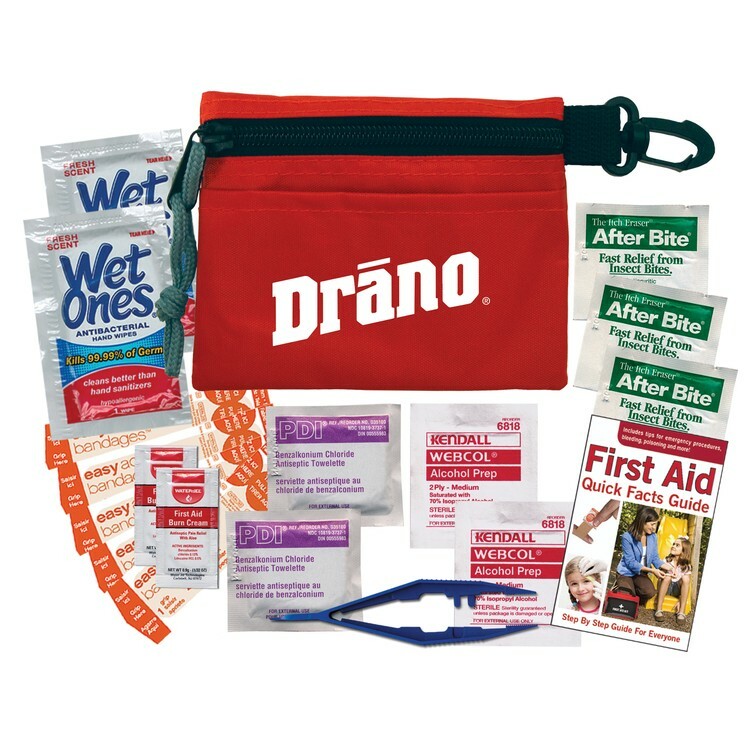 Our Storm Disaster Kit includes a variety of High Quality emergency items, including a 5 function Life Gear Flashlight, food Bar, emergency water, emergency blanket, whistle and first aid essentials. Also features an oversized hook and handle. 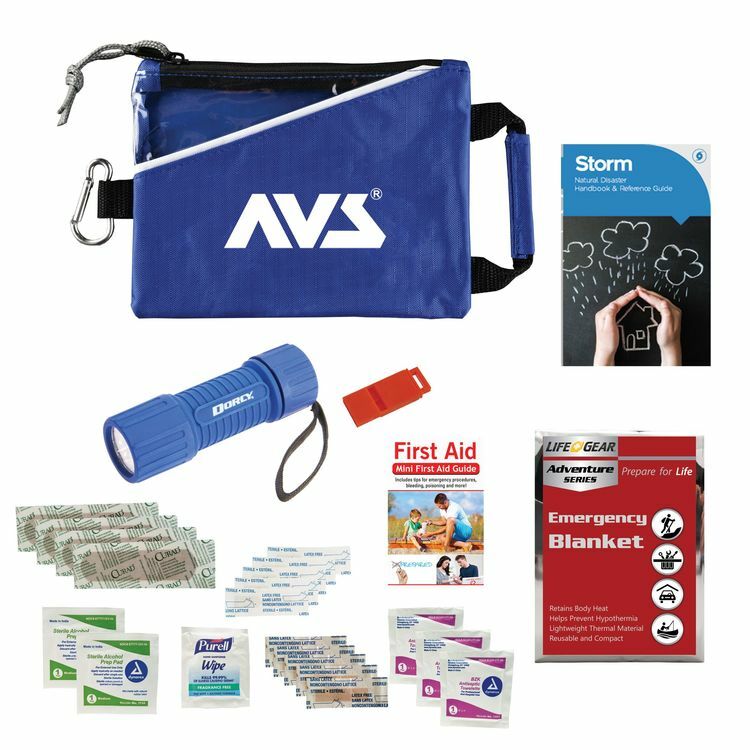 Designed to fit neatly in a desk or a glove compartment this kit includes the necessities such as a reliable LED Flashlight, Emergency Manual, Emergency Blanket, Whistle and a first aid kit. Although our travel bag has most of the items for a trip, we have left room for some other personal items as well. Also an excellent choice for a Hygiene kit or for a homeless kit. 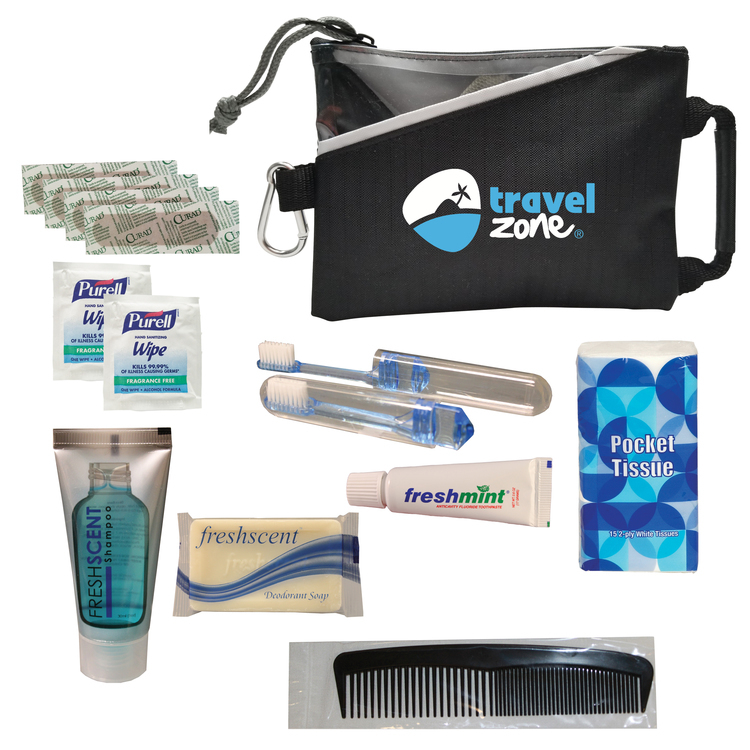 It includes: 5 Flex-Fit Bandages 3/4" x 3" , 1 Tissue Pack, 1 Travel Toothbrush 2 Piece , 1 Freshmint Toothpaste Tube , 1 Deodorant Soap, 1 Shampoo Bottle 1oz, 1 Plastic Comb, 2 Purell Anti-Bacterial Wipes. 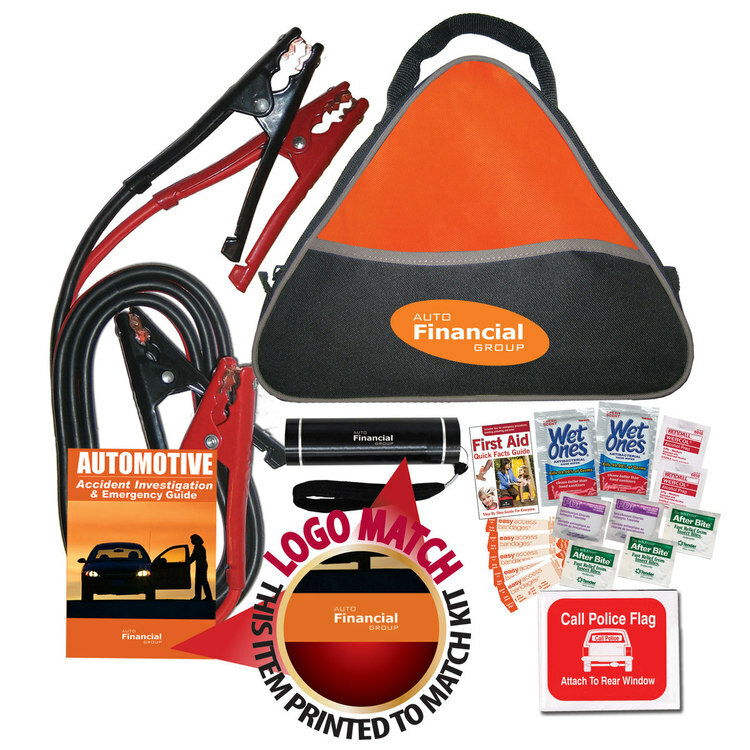 Stay on your game with this carefully crafted Trade show Kit. 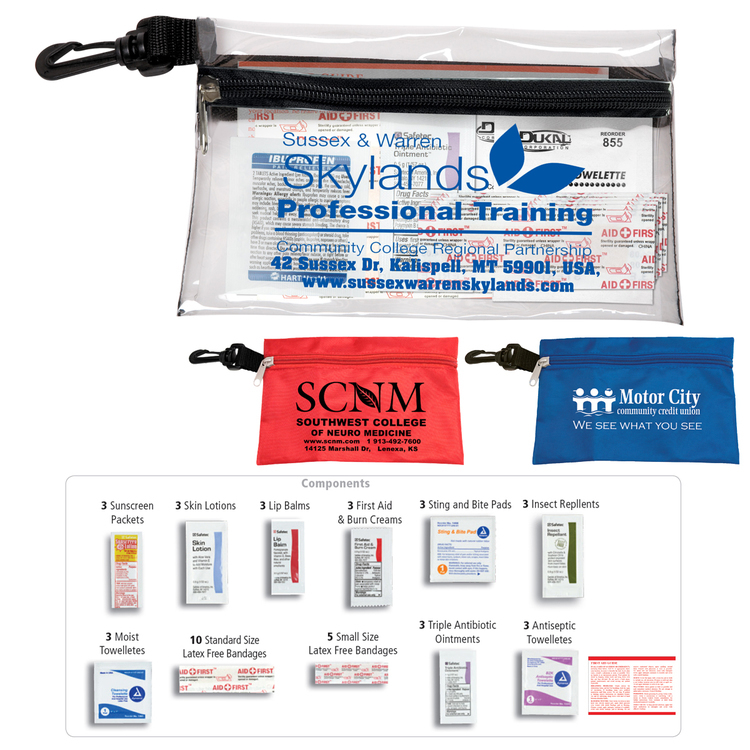 This convenient trade show kit will have you back on your feet and ready for your meeting or conference. 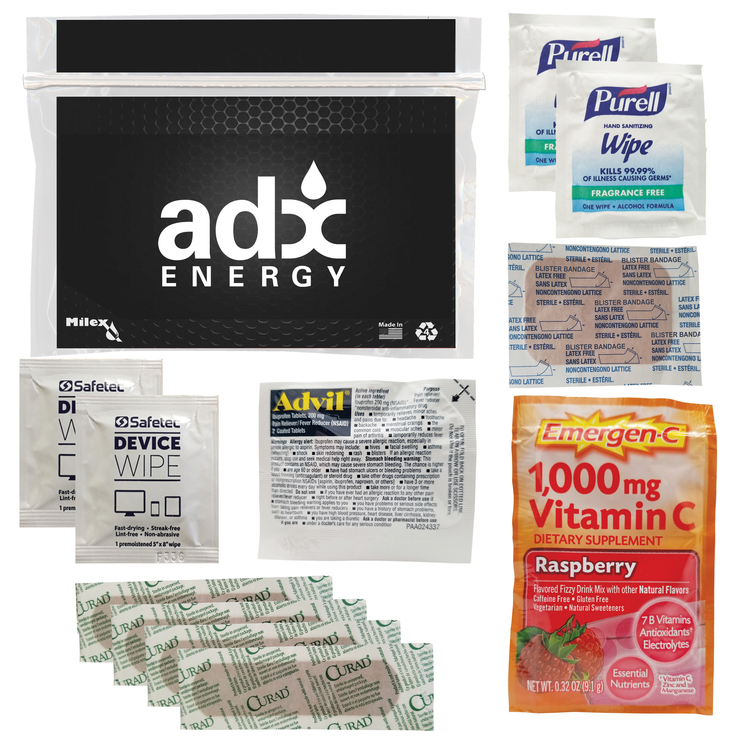 Kit contains blister pads, Advil, Emergen-c, First Aid basics and our must have device wipes. 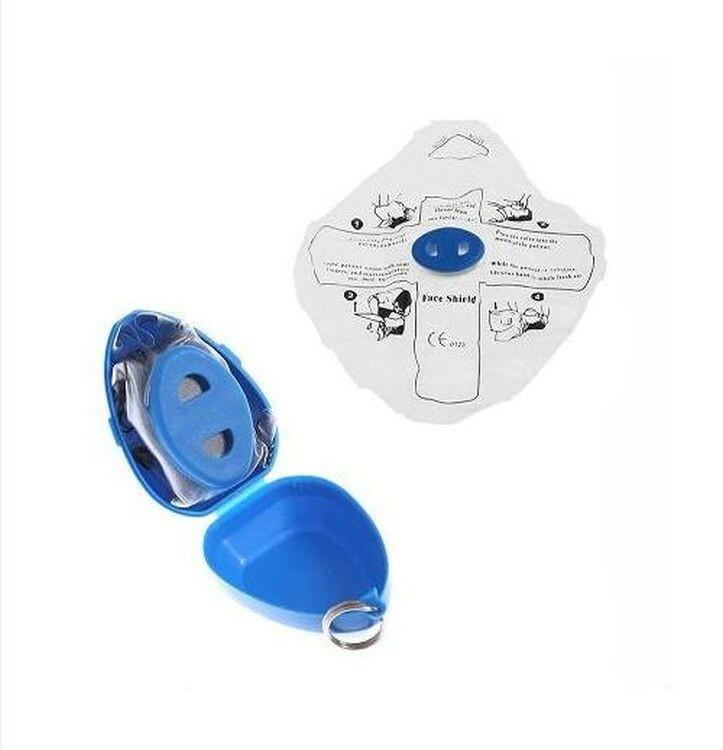 Durable living hinge box contains six adhesive bandages five junior bandages three antiseptic towelettes extra large bandage and first aid card. Price includes one color imprint. 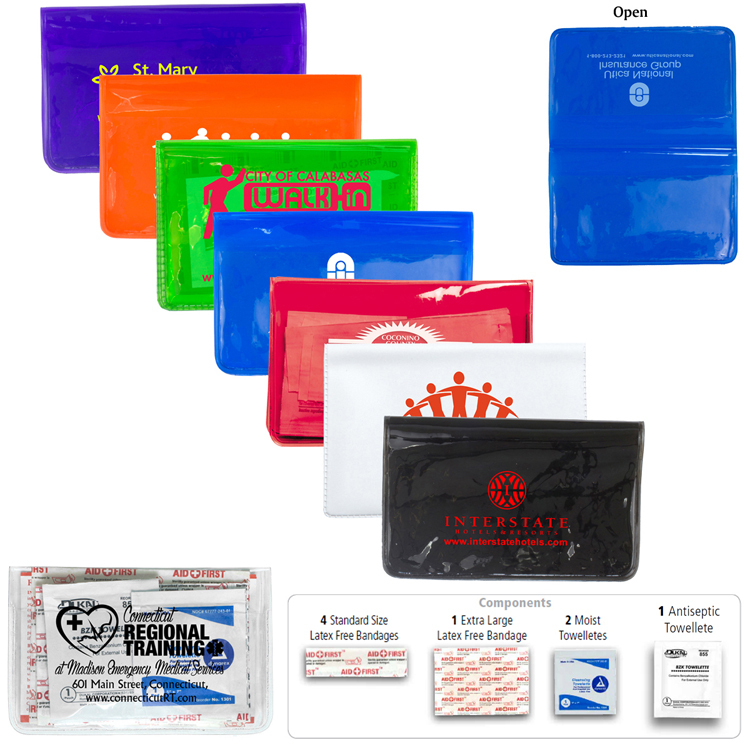 This vinyl wallet style first aid kit contains: 6 Standard Size Latex Free Bandages, 4 Small Size Latex Free bandages, 1 Extra Large Bandage, 1 Moist Towelette, 1 Antiseptic Towelette, 1 Triple Antibiotic ointment and a First Aid Guide. 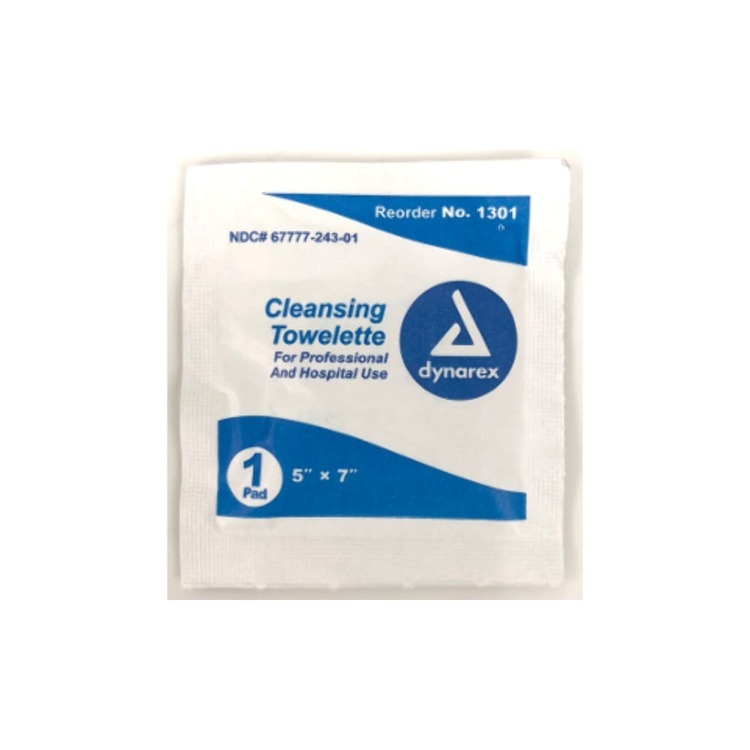 Cleansing Towelette in individually sealed travel size package. 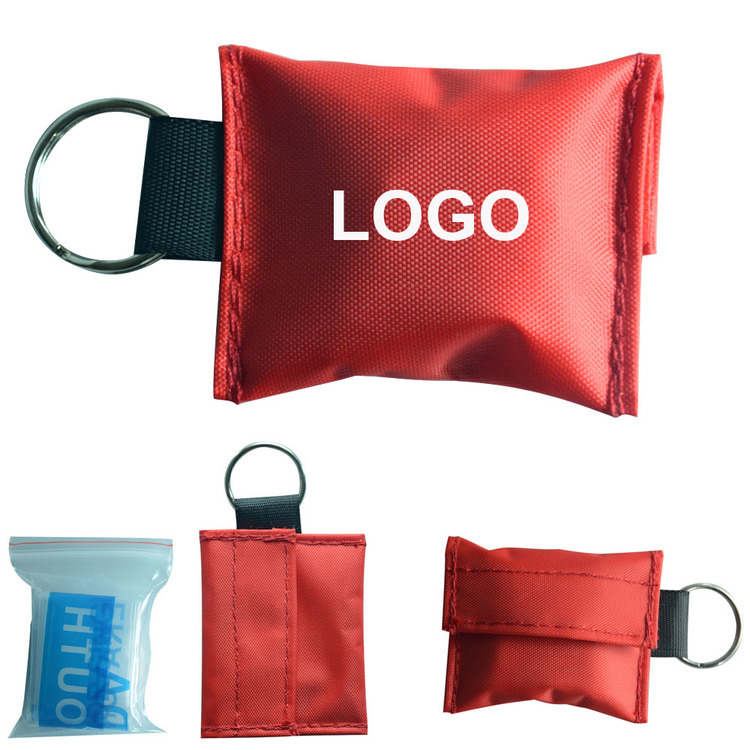 Components inserted into Zipper Pouch with Plastic Carabiner Attachment. 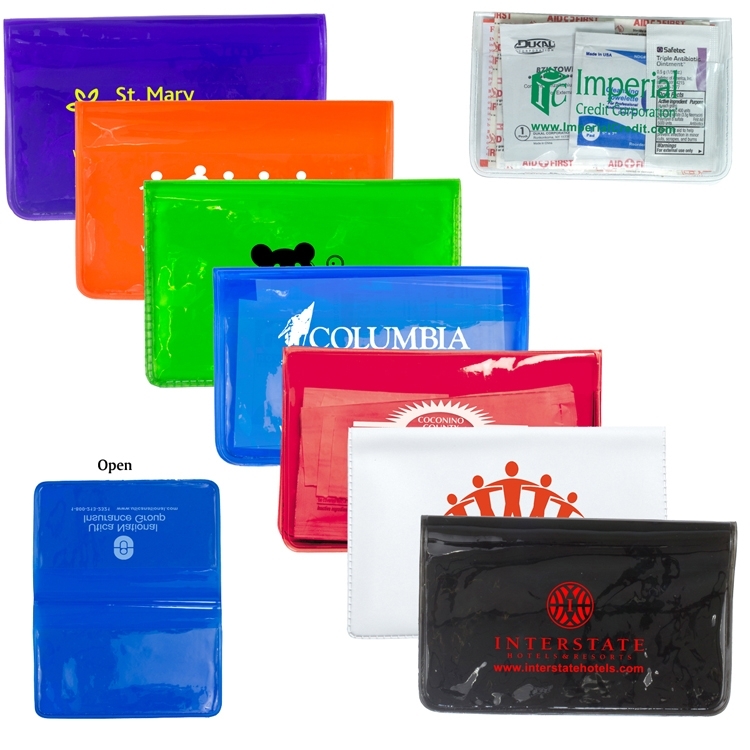 This zippered pouch contains: 5 Small Size Latex Free Bandages, 10 Standard Size Latex Free Bandages,3 Sunscreen Packets, 3 Lip Balms, 3 Skin Lotions, 3 First Aid & Burn Creams, 3 Insect Repellents, 3 Sting and Bite Pads, 3 Triple Antibiotic Ointments, 3 Moist Towelettes, 3 Antiseptic Towelettes and 1 First Aid Guide. Components inserted into Translucent Zipper Pouch with Plastic Carabiner Attachment Doctor's Kit includes: 6 Small Size Latex Free Bandages, 8 Standard Latex Free Bandages, 1 Extra Large Latex Free Bandage, 2 Antiseptic Towelettes, 1 Triple Antibiotic ointment and 1 First Aid Guide, PLUS a 200 mg Ibuprofen (Cedaprin) Packet. FDA Compliant. 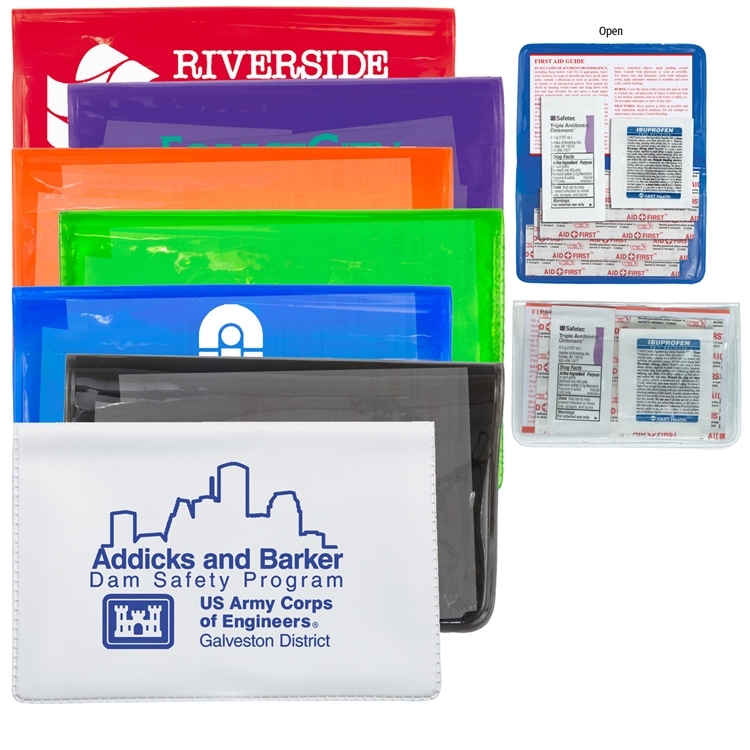 Components inserted into Translucent Zipper Pouch with Plastic Carabiner Attachment This first aid kit contains: 6 Standard Latex Free Bandages, 3 Small Latex Free Bandages, 1 Extra Large Latex Free Bandages, 2 Antiseptic Towelettes and 1 First Ad Guide. 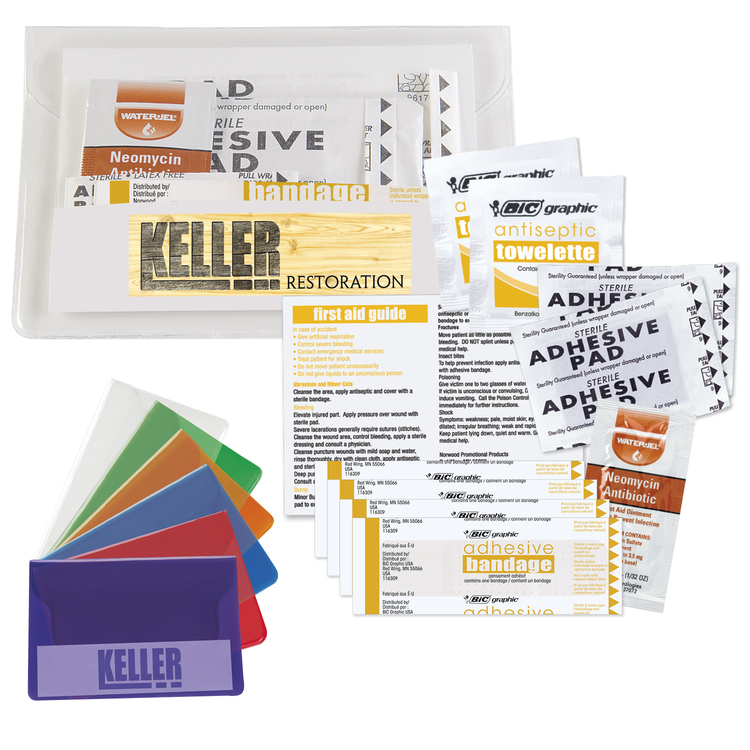 This first aid kit contains 6 Standard Size Latex Free Bandages, 1 Extra Large Latex Free Bandage, 1 .5 oz Citrus Scent Hand Sanitizer Antibacterial Gel and 1 First Aid Guide. 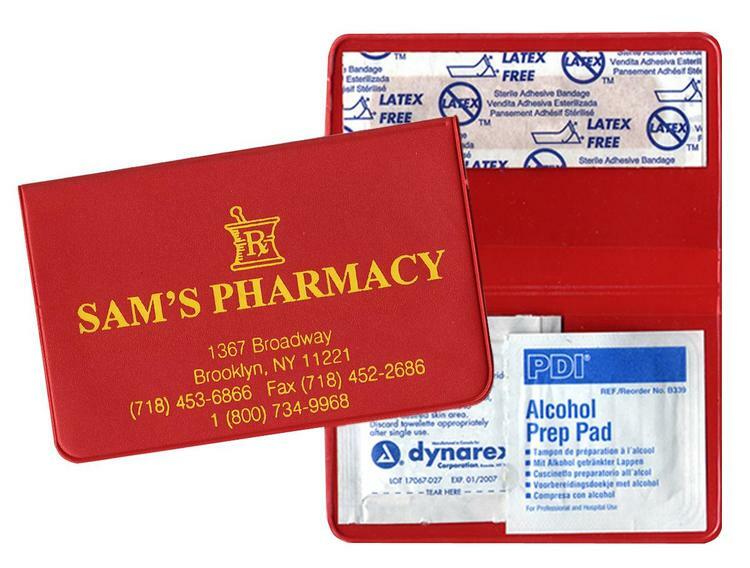 This vinyl wallet style first aid kit contains: 4 Standard Size Latex Free Bandages, 1 Triple Antibiotic Ointment, 1 Ibuprofen packet and 1 First Aid Guide.